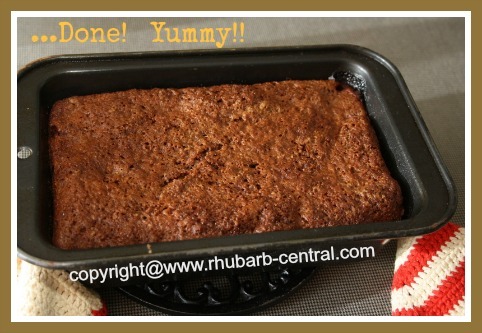 Here is a delicious Strawberry Rhubarb Bread Recipe which was sent to me by a kind website visitor to Rhubarb-Central.com. 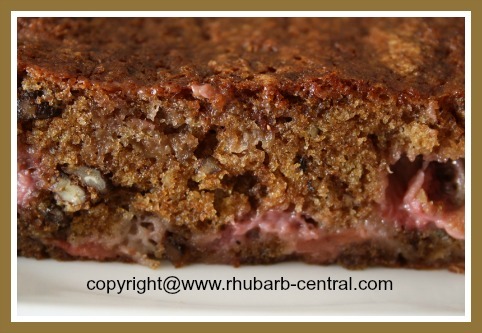 This rhubarb bread recipe can be made using fresh OR frozen rhubarb and strawberries. 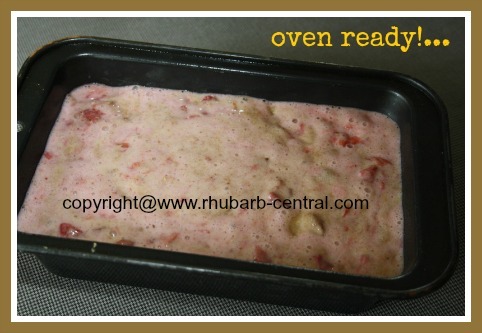 I like to use some of the many bags of frozen rhubarb in my freezer to make rhubarb loaves and rhubarb muffins, and this recipe is one of them! If you are planning to make this recipe with your frozen rhubarb, simply defrost the frozen rhubarb in a sieve over a bowl. I usually do so on the kitchen counter the evening before, and then discard the excess liquid. Be sure to thaw enough frozen rhubarb, as it tends to "shrink" after it has thawed! In a medium size pan, combine the chopped strawberries and rhubarb, bring to a boil over medium-high heat, and then reduce temperature to low heat and allow the mixture to simmer until slightly tender (about 6 minutes). 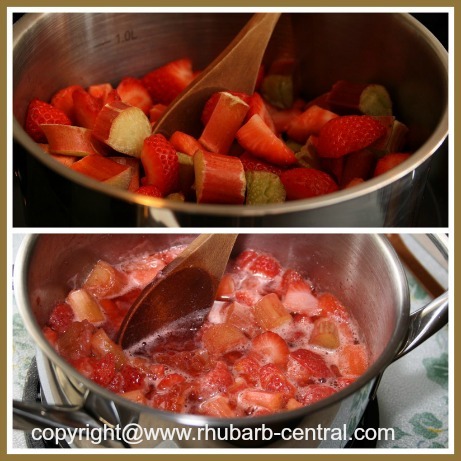 Remove the rhubarb/strawberry mixture from the heat, and allow mixture to cool. In a large bowl, whisk together the whole-wheat flour, all-purpose flour, chopped nuts, sugar, soda, and the salt. In a smaller bowl, whisk the eggs, and then add the almond extract and the vegetable oil. Gradually add the egg mixture to the dry ingredients mixing just until well combined. Do not over-mix. Over-mixing will result in a quick-bread that is too dense. 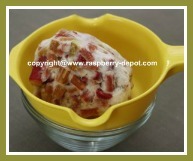 Gently fold in the cooled rhubarb and strawberry mixture. Transfer the bread batter into a greased (I use non-stick cooking spray), 8" x 5" (or smaller size if you desire a higher loaf) loaf pan. Bake at 350° F for about 50 - 60 minutes, or until a toothpick inserted in the center comes out clean. Cool bread in pan for about 10 minutes, and then remove the rhubarb bread to a wire rack and allow loaf to cool completely. 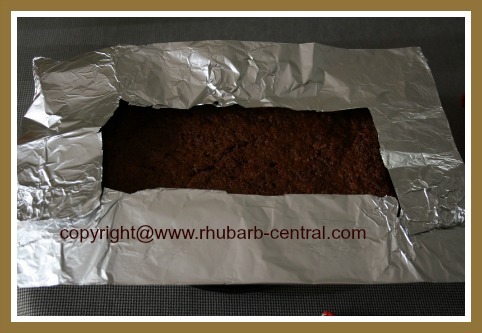 To avoid the edges of the rhubarb bread from becoming too dark or burning, I like to make a shield out of aluminum foil, as you can see in the image above. Place this over the pan after the bread has baked for about 40 minute. Works great!